If you’re as big a Top Chef junkie as I am, Tiffany Derry has paid your living room multiple visits, and made you very very hungry. The alum of Season 7 and Top Chef All-Stars is best known for her booming laugh, perfectly executed seafood and southern specialties, and for her “don’t mess with Texas” attitude in the kitchen. After all, not every chef has the guts to serve Tom Colicchio okra. Phoebe Lapine: What was your favorite food as a kid? 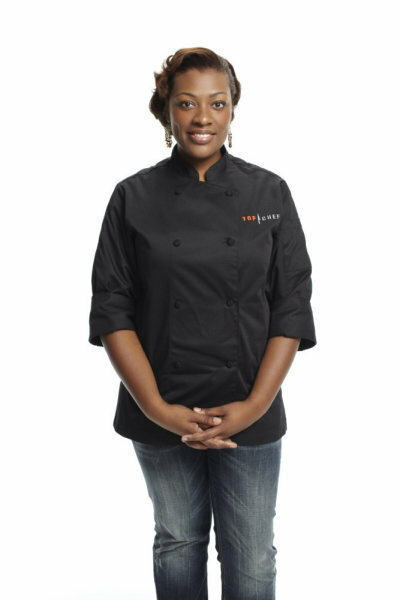 Tiffany Derry: My favorite food as a kid was any green vegetable, but I really loved braised mustard greens. P.L. What is your all-time favorite meal to eat now? T.D. I would have to say one of the things that I never grow sick of is macaroni and cheese. It has to be super cheesy and baked into a casserole dish. I developed a recipe with a few varieties of Sargento all natural shredded cheese including Extra Sharp Cheddar, Mozzarella & Provolone, and Parmesan, mixed together with bacon for crispy-ness and green onion for added flavor. It’s the ultimate mac and cheese recipe! The all-natural cheeses give it a rich, authentic flavor, and the bacon and green onion add a nice pop of texture and taste too. P.L. Do you have a go-to late night snack? T.D. I’m not much of a snacker — I really just eat what I need to eat. The one thing that I am addicted to, which is a really bad habit of mine, is sour gummy worms. I have them in my purse all the time! P.L. Is there anything you won’t eat? T.D. There’s nothing that I won’t eat that I haven’t tried before. One thing I have tried that is just not for me is the hundred year old egg. I had it in China and I’m not a fan. It’s made by coating duck or chicken eggs in a clay-like plaster. And when it comes out, the egg is black and it’s not good. P.L. If you could study abroad anywhere, where would it be? T.D. I would go to Italy. To be able to spend more time studying there would be amazing. I could visit a number of regions and study each of their culinary differences. P.L. Any recommendations for good “brain food” for a late night in the library? T.D. I like to do my own snack pack of almonds, cashews, dried cherries and raisins. Fresh fruit does amazing things for you, too. I love red grapes because they are sweet and plump. P.L. If Top Chef was the “grad school” for your culinary education, what was the most valuable thing you learned? T.D. Go for it with everything you have. At the end of the day, you’re still going to be judged the same. Top Chef taught me to cook the food that I want to cook instead of trying to please other people. It gave me a boost of confidence, which was so much more meaningful to me than winning anything. P.L. On Top Chef Masters there was a dorm room challenge where the chefs were forced to cook with just a hot plate. What would you make in this scenario? T.D. That’s a tough one, but I think I would go for some kind of fancy sandwich. It could have nice crusted bread, meat and lots of natural melted cheeses. The trick would be to keep it simple so I could execute it. You can’t try to go too crazy! Phoebe Lapine is a cofounder of Big Girls, Small Kitchen and Small Kitchen College.